Bob Brewer takes you on the road for a three-part series of craft beer adventures. Beer fests, whisky fests, special events, trade shows and promos. Even a music festival or two. Anchor does them all. Whether they are nearby or somewhere else across the country, it takes some logistics to bring it together. 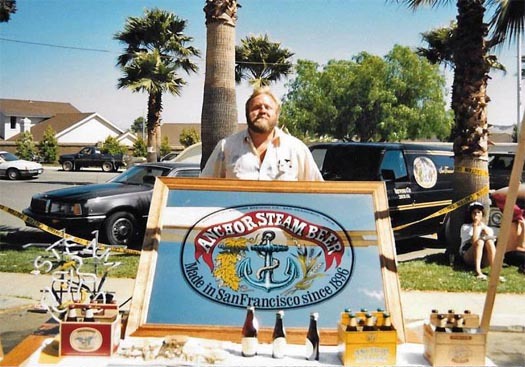 When I first started to do beer fests for Anchor back in the mid 1980’s it was a basic thing. We were going to the party and bringing the beer! Along with a bunch of other brewers, we just dragged a couple of kegs and a jockey box – if we even had one back then – to the venue, set up on the table provided, and served. When it was all over, we threw everything back into the van and left. Bob Brewer on the road in SoCal, circa mid-1908s. Easy stuff, simple times, and all we needed was the beer, the box, and a banner. We can still get away with this a bit for the small and local events, although we’re a lot more sophisticated with our set up. But for the road shows… oh, how things have changed. These days beer festivals are complicated and (hopefully) well-organized affairs with lots of rules and (mostly friendly) competition amongst the brewers. There are registration fees, licensing fees, insurance requirements, and even special permits for servers in some states. As these events get larger and move into convention centers and the like, union labor rules often apply. It can get really expensive really fast if you’re not prepared. 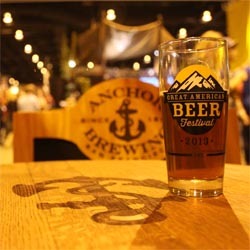 In my experience there are four main types of road shows: Mega beer fests like GABF (Great American Beer Festival); industry conventions specific to beer and spirits, such as the NBWA (National Beer Wholesalers Convention); trade shows that include beer, like restaurant and bar shows; and the away version of the local beer fest. 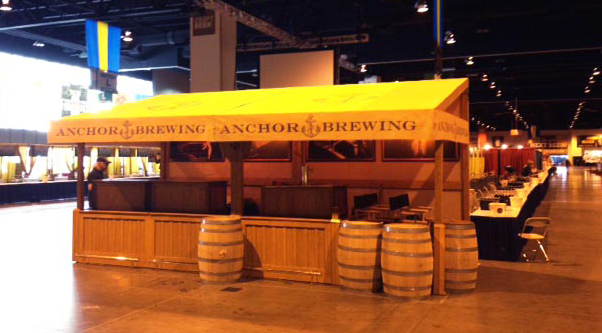 Pouring Anchor brews at the World of Beer Festival in Raleigh, North Carolina. All require a degree of advance planning and preparation as well as a good battle plan for the operational phase of the event and its aftermath. Sounds like a whole lot of fun. It’s America’s Oktoberfest and everybody is going to be there. There’s going to be over a thousand beers and ten thousand attendees (per session), and if you want to showcase your totally awesome lineup of beers, you’d better do something to stand out in the crowd. The basic set up is a long line of tables arranged by region where you get your allotted space and a backdrop to hang your banner. For most participants, the beer is run from an iced keg into a pitcher and then poured into the glass of the eager beer fan, often by a volunteer server. Not the best presentation by a long shot. Early on I decided to up the ante a bit by bringing my own custom equipment and my own crew. Although I used volunteers, a brewery rep was always there. This required a two-day road trip each way and a couple of hours to set up and take down. But we looked good. After a few years, many other breweries were bringing custom equipment and larger booth spaces were available for those who wanted to have a greater presence. We decided to get our own larger booth space as well. This is where things started to get interesting in that we needed a booth to fit the space. It would have to reflect the theme of the brewery, be designed to be erected and dismantled by a small crew, and be easily crated for shipment by us or by common carrier. A month or so of design work and some crafty carpentry by a small crew and we had it. Three crates for the booth and three crates for the draft equipment which doubled as our serving tables and we were ready to go. The adventure was just beginning. We had gotten this far with the project and were feeling pretty good about things. I had hired my ace carpenter to come along to supervise the booth assembly, and since we were delivering it ourselves via rental truck, he was the relief driver as well. 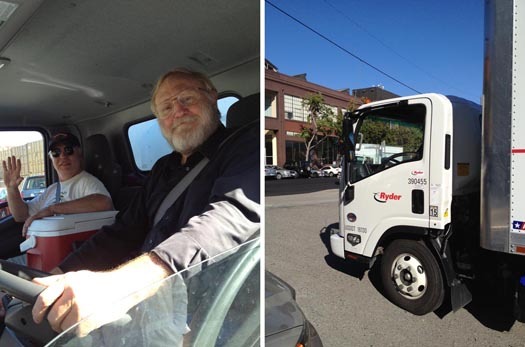 Driving an eighteen foot diesel Ryder truck from San Francisco to Denver takes two fourteen-hour days. Bob (right) and John hit the road from San Francisco bound for Denver and GABF. We had to cross over the two tallest mountain ranges in the lower 48, the Sierra Nevada and the Rockies, while driving across the entire states of California, Nevada, and Utah – and halfway across Colorado, too. I’d driven this route many times but not on a tight schedule, and usually sitting in a comfortable full-sized Suburban with a nice stereo. As we drove through the night approaching the Nevada/ Utah state line and our first day’s stopover, I really wondered how I was going to hold up. We had another long drive the next day followed by three days of the fest. There were only about seven hours allowed to set everything up before the doors opened for the first session. No pressure here, and another three days to pack up and drive back. Add on the two days it took to organize and load out and we were looking at a ten day run without a break. It was only the first day on the road and I was already feeling beat. Fortunately I had my carpenter/driver/booth expert/roadie, John, along to help. 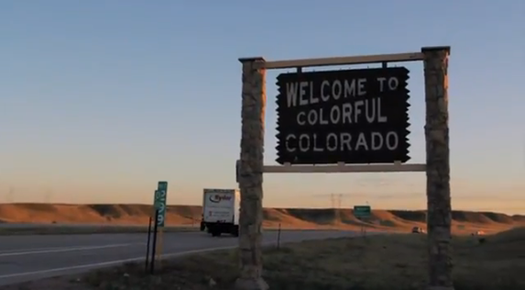 In order to make the best time, we left at dawn the next morning hoping to get to Denver by late afternoon and relax a bit before the hitting it the next day. That arrival part worked out great, but the next day didn’t go quite as well. We couldn’t get the truck into the loading dock until 10:00 AM and that put us back an hour. John and I had pre-assembled the booth in our warehouse as a dry run but we took a whole day to do it. We were looking at six hours and an inexperienced crew with a complex array of components to the set-up, draft equipment, lighting, decoration, etc. The idea was not to get ahead of ourselves in any area so that we didn’t get in each other’s way. The clock was ticking and it didn’t look good, but we got organized. A division of labor with John supervising the construction and me running ground control developed and we started to make up some time. By the time the empty crates were hauled away and we had the kegs tapped we had managed to finish with a good ten or fifteen minutes to spare before the doors opened. Well, there we were. All set up and ready to go. Waiting for our adoring public to flock to our counter. And flock they did. After all we had we had a good location and a highly visible, professionally designed, handsomely crafted and beautifully decorated booth offering a selection of America’s finest craft beers. But the work didn’t stop there. Someone has to work the booth. Kegs have to be changed, ice managed, buckets emptied, counters cleaned, and beer served. There has to be a work schedule for the taps with at least three servers and a backup at all times. Breaks have to be worked in. It’s like running a busy bar. Everyone has an assignment. We were busy. Very busy. Four days into the event and not even half way done. Maybe sometime during the next two days I’d have a chance to get away and visit some of my industry friends. As is turned out I just stayed at the booth and many of my friends came by to visit me. Bob with (left to right) Garrett Oliver of Brooklyn Brewing, GABF founder Charlie Papazian, and Vinnie and Natalie Cilurzo of Russian River Brewing. There’s an ebb and flow to big beer events like these. The early crowd, who has been in line outside for hours, moves with purpose to seek out some of the breweries that have rare beers on tap. The next arrivals just work their way through the hall selecting at random and navigating through the crowd from one area to another often returning to the same booth with friends in tow to show off their new found favorite beer. The energy level goes up along with the crowd noise as the session progresses. Things slow down a bit toward the end and then pick up in a final rush at last call. I have learned to avoid the last rush by shutting down a few minutes early. Even so, by the time we clean up, secure the booth, and get out of the hall, it’s almost too late to find a restaurant that’s serving. And its only Thursday night and we have two more days to go. The Friday night session was just as busy as Thursday night was, but since we were already set up and had the morning off to somewhat recover, it was easier at first. Friday, however, isn’t a school night and the crowd came to party. They were lining up a couple of hours early. All of them it seemed as the queue stretched around the block. I went inside and rallied my crew for the onslaught. I mentioned about the ebb and flow of these events but Friday at the GABF is all flow and no ebb. The crowd rushed in and we served them non-stop until last call. We were so busy that there was little time to get out and walk around. The atmosphere in the hall reached fever pitch in about ten minutes and stayed there for the duration. Every so often someone would drop a tasting glass and at the sound, a mighty cheer arose from the happy beer fans. A few years back, the original classy tasting glass was replaced by a plastic one because of the breakage problem. Beer coasters, which were treasured collectables, had to be banned because they became mini Frisbees at the height of the festivities. As soon as somebody threw one, there were fifty more in the air and people were getting hit in the face. Anyway, the party raged on. 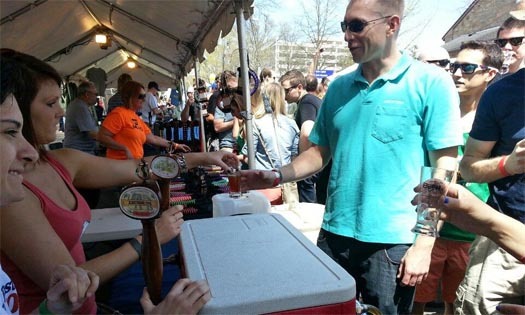 Festival organizers limit the sample pour to 1 ounce. A wise policy since there is enough beer in the hall to float a battleship. With the exception of a few knuckleheads, the vast majority of the attendees had a rollicking good time and paced themselves. At the end of the Friday session, cumulative fatigue was starting to kick in. There are many after parties around town on Friday night and a few of the crew went out and about. I went to bed. Saturday was going to be a long day with two sessions and only a short break in between. 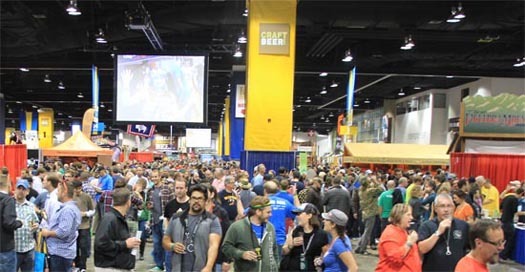 Saturday at the GABF is an interesting day. There are two separate sessions. The first session is a sort of an industry, press, and VIP event which is supposed to give the brewers an opportunity to go around and visit other booths and get some sampling in. There’s still a big crowd though, just a slightly more subdued one. We had a lot of our national distributors stop by as well as some of our venders, fellow brewers, and other industry types. The winners of the judging are announced and there is a bit of a rush to sample the award winning beers. The justifiably proud winning brewers are seen strutting about wearing their medals and engaging in a bit of chest thumping. And then there is there was the rush to get out of the hall and get a lunch break in because the final evening session was coming up and we knew it would be a repeat of Friday night. Only longer. I lost a few of my crew who had to leave early or were otherwise engaged so we were a bit short handed. No problem, we’ll just cut short the breaks. Halfway through we started to run out of the more popular beers. Again, no problem. We shifted focus to what we had left and those beers went just as fast. Less beers to pour, less staff needed, we caught up on the breaks. The trick here is to start to clean up and organize the booth for breakdown as we went along so that everything didn’t have to be done in a rush at closing. Teagan, Dane, Mark Carpenter, and the Anchor crew pouring Anchor brews fresh from the tap for craft beer enthusiasts at GABF 2014. Since we wouldn’t be able to break down and pack until Sunday morning we needed to get a jump on things. In the chaos of the aftermath of the final session, it is really important to have everything in the booth that isn’t nailed down put away and secured as best as possible. All valuables have to be locked up or taken with us. Any loose signage or tap handles will be gone by morning. Everything that we could clean and pack was taken care of. All in all, a good show. I was off to bed but some of the remaining crew decided to go out one last time. Sunday morning at 8AM yeoman John and myself went back to tear down and pack up. What had been a well-organized beer fest was now organized chaos. Our booth was intact however and we started the process of breakdown. My crew had diminished further with a few no-shows and some who urgently needed to be on their way home. No problem, they would have been in the way anyhow. I made a few mental notes here to put together a much more formalized roster next time with specific assignments arranged beforehand. Again, we formed a divide and conquer system and the whole process went smoothly as could be expected. Cleaned up, dismantled, crated and loaded out in the Ryder truck by 1PM. The stalwart remainder of my crew was thanked and dismissed, their contributions to the effort duly noted for later consideration. Yeoman John and I parked the truck and found a bar to watch the afternoon football games and have a few beers. Monday early AM we hit the road back to San Francisco. Another two day drive. Ten day run. We were beat. But we weren’t done yet because there was another show coming up real soon. This time In Las Vegas. Caesars Palace. The National Beer Wholesalers Association convention. 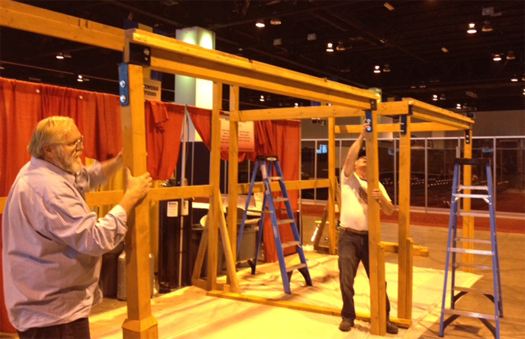 This time we would ship the booth by common carrier but we would still have to set it up and take it down. It’s a whole different ball game and I had to unpack the crates and shuffle things around a bit. I had a whole three days after we got back to get everything ready for shipment.